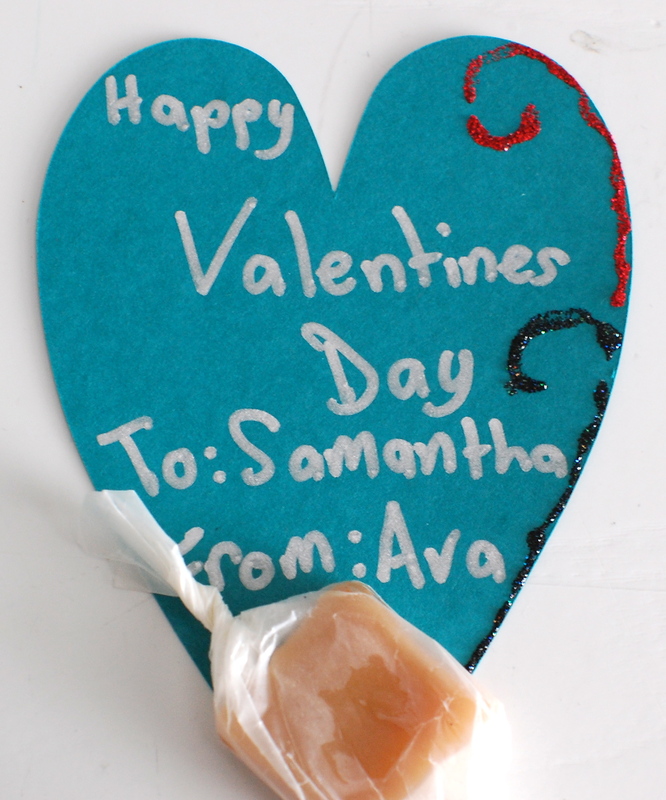 Salted Caramels: Happy Valentine’s Day! My crafty and creative older daughter started her class Valentine’s project early this year, knowing even without my prompting that burnout can set in quickly once the novelty of fancy paper, glitter and flashy pens wears off. In addition to the lovely cards, she also settled on the lofty goal of making homemade candy. Salted caramels seemed easiest to tackle though I have to admit I was skeptical, given previous experience that resulted in a lovely sauce instead of a cute candy. Using a different recipe, she made her first attempt last week. Unfortunately, that turned into teeth-cracking toffee. I was ready throw in the towel and go with a drugstore standard, but there is nothing like a 3rd grader’s motivation to inspire another try. I didn’t have much hope seeing as how we seemed to do everything right in previous rounds. I didn’t even photograph the process, which has become a standard part of my cooking and baking routine these days. But much to our collective delight (especially that of my sweet tooth) they turned out great. Big thanks to Ina Garten for making this so easy! PS These make terrific gifts for kids and adults any time of the year! Before you begin, it is most helpful to have all the ingredients measured and ready. You have to move quickly once the cooking process begins. A candy thermometer is a must. In a deep saucepan with straight sides (makes attaching the candy thermometer easier), combine 1/4 cup water, the sugar and corn syrup. Bring them to a boil over medium-high heat. Boil until the mixture is a warm golden brown. Do not stir, just swirl around the pan. In the meantime, in a small pot, bring the cream, butter and 1 teaspoon of sea salt to a simmer over medium heat. Turn off the heat and set aside. Step 3: Finish the caramel. When the sugar mixture is done, turn off the heat and SLOWLY add the cream mixture to the sugar mixture. Be careful — it will bubble up violently. Stir in the vanilla with a wooden spoon and cook over medium-low heat for about 20 minutes, or until the mixture reaches 248 degrees F (“firm ball”) on a candy thermometer. Step 4: Fill the pan. Very carefully (it’s hot!) pour the caramel into the prepared pan and refrigerate for a few hours, until firm. Step 5: Cut the caramel. When the caramel is cold, transfer the block onto a cutting board. Cut into bite-sized pieces (or, try to roll into a log, then cut, as suggested by Ina. Here is a pictorial. To be honest, this looked really awkward and difficult. I did not bother). Step 6: Wrap the candies. 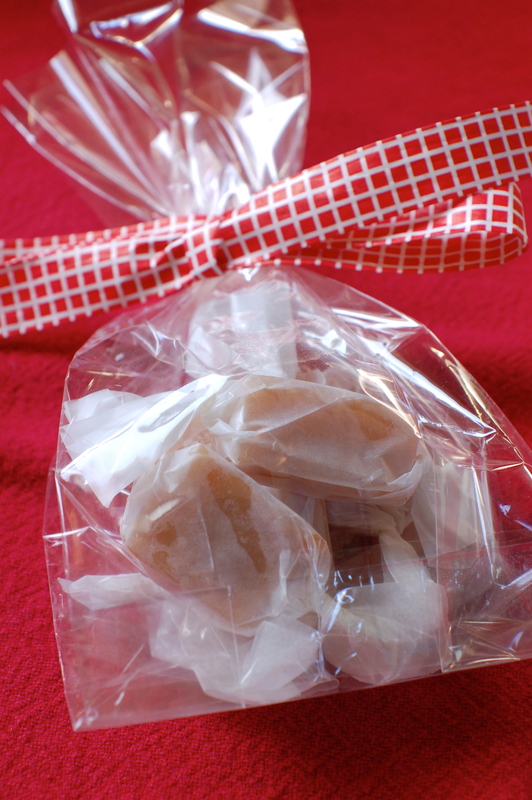 Cut wax paper into 4-by-5-inch pieces and wrap each caramel individually, twisting the ends. Store in the refrigerator until you are ready to serve or gift. Fun! Caramels are my absolute favorite sweet. I can’t wait to make them. We loved the heart card too! Will have to pass this along to my Talia… Love it! Tal made us dark chocolate covered pretzel thins and bananas with pink crystal sprinkles – delish!